We have all been in the situation when you really don’t want to workout that day and skipping sounds like a better idea. You feel tired, work got you down, things around the house are crazy, its 10 pm at night, there is a big game on and you can’t miss it, etc. You give in and skip working out that day. I’m not going to say I haven’t missed a day or two in the four rounds of P90X I’ve done since 2008. Those things happen. Sometimes your schedule is overtaken by outside forces that you cannot fight against. What I think is most important after missing a workout or two during your 90 days of P90X is if it made you a little mad you missed it or if you just brush it off. If your mad you missed it then you know your going to keep coming back for more. If you brush it off then its leading into a habit of allowing it to happen again when not so important things try to get into your schedule. Yes. It takes most people 110 days to complete an entire round of P90X. It’s not because they can’t set aside 90 straight days to do P90X. It’s because they have other physical activities set up in their lives and trying to do P90X and play a sport or an activity is too much. This is called over-training. I’m in that same boat. In the winter I go snowboarding or skiing once a week and in the summer I play double-header softball games twice a week. Throw in a weekend tournament, round of golf, or the 40 miles of bike riding I do a week and that adds up. It takes a lot out of me but I enjoy doing those things. As long as I’m being active then I don’t think its going to hinder my results at all through P90X or whatever program I’m doing. 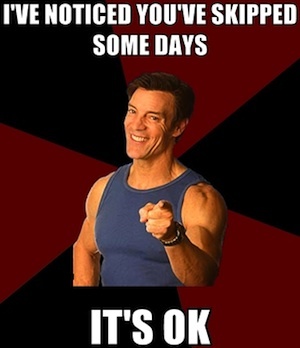 Tony Horton would probably agree. I workout to be able to enjoy those things. What’s key is to plan P90X around the things you like to do. Who cares if it takes you 120 days to complete P90X if you are being active during that time. You will still results. Will It Take Longer To See Results If I Skip Workouts? Yes. It will take longer to see P90X sort of results if you’re doing other things. If you’re not following the P90X workout plan the body won’t master the P90X moves. If you’re skipping lots of workouts every week then you might never see results. You’ll probably be healthier and a little bit fitter but you’ll never get everything you can out of P90X if you’re only doing P90X three times a week. How To Get Results With P90X If I Skip Workouts? Eat healthy. I remember Tony Horton saying one time that over 70% of your results with P90X (or any program) come from following the meal plan. Keep drinking Shakeology every day so your body is getting the nutrition it needs to properly function. This way you’ll feel ready for tomorrows workout. How To Make Sure I Don’t Skip P90X Workouts? Schedule a time to workout every day. It keeps you accountable and lets everybody else know what you’re doing. You’ll have to figure out the best time to do P90X but make sure you do it. Do everything you can to not skip workouts. If your playing sports, training for a 10k, or doing something else active then don’t kill yourself about skipping a P90X workout because in the end your really not. It’s all about living a healthy and fit life. P90X is just a plan to help you get there.